Pope Francis stressed this today, March 18, 2019, when addressing the Camillian Charismatic family, stressing how loving service to the sick, means being also tender. 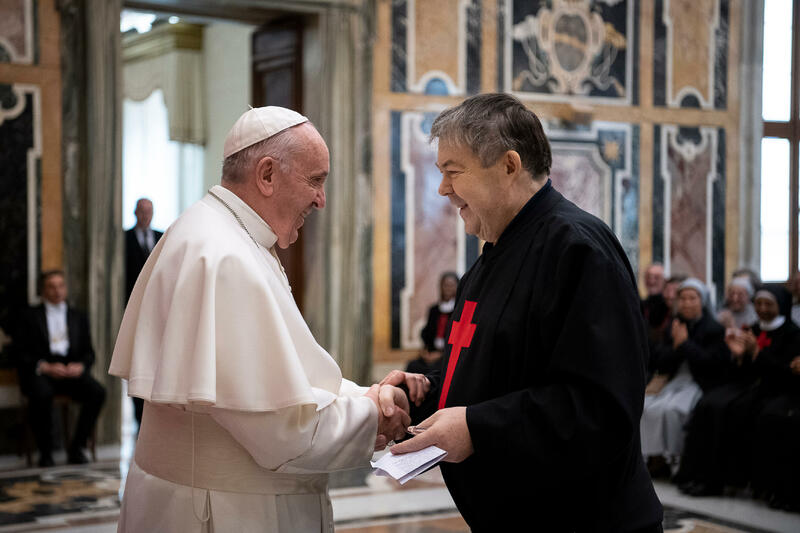 The Holy Father praised that they are “constantly committed” in a “loving and generous donation” to the sick, “carrying out a precious mission” in the Church and in society, next to the suffering. Pope Francis concluded, praying to the Holy Spirit to sustain this new stage of your journey as Camillian Charismatic Family, blessing them, their communities and those they care for, and asking them to pray for him. It’s with joy that I receive you all, representatives of the various expressions of the Camillian Family! I greet you affectionately and thank Father Pessini for his words. And I ask the Lord to keep his sense of humour: You will never have a stomach ulcer! You are constantly committed in a loving and generous donation to the sick, carrying out a precious mission in the Church and in society next to the suffering. When sickness comes to disturb and sometimes to overwhelm our life, then we feel intensely the need to have next to us a compassionate and also competent brother or sister, who consoles us, supports us, helps us to recover the precious good of health, or who accompanies us to the threshold of our final encounter with the Lord! The entire Church as a whole has received from her Master and Lord the mandate to proclaim the Kingdom of God and take care of the sick (Cf. Luke 9:2), in imitation of Him, the Good Shepherd, the Good Samaritan, who went through this earth “doing good and healing all those that were prisoners of sickness” (Common Preface VIII). However, in particular, God bestowed to Saint Camillus of Lellis and to all those who follow his example, the gift to relive and witness Christ’s merciful love to the sick. The Church has recognized it as an authentic charism of the Spirit. You live it in an exemplary way, translating it into life according to the double binary of assisting directly the sick, especially the poorest, in their corporal and spiritual needs, and to teach others the best way of serving them for the benefit of the Church and of humanity. All charisms “are gifts that the Holy Spirit gives us [. . . ] Gifts <that are> given, not to be hidden, but to share with others. They are not given for the benefit of the one who receives them but for the benefit of the People of God. If, instead, a charism is used to affirm oneself, one must doubt that it’s an authentic charism or if it’s faithfully lived. Charisms are particular graces given to do good to many others” (Catechesis, November 6, 2013). They always have a transitive character: they are directed to others. In the course of the years you have striven to embody your charism with fidelity, translating it into a multiplicity of apostolic works and into pastoral service for the benefit of suffering humanity worldwide. In the wake of this mission, which some members of your Religious Families have lived heroically, becoming model of holiness, you are called to continue your service in a prophetic way. It’s about looking at the future, open to the new ways of apostolate that the Spirit inspires you and that the signs of the times and the needs of the world and of the Church require. The great gift you have received is still relevant and necessary also for this our time, because it’s founded on charity, which will never end (Cf. 1 Corinthians 13:8). As a living part of the Church, sent to spread the Gospel so that men “may have life and have it abundantly” (John 10:10), you have the wonderful opportunity to do so precisely through gestures of the care of life and of integral salus, so necessary also in our time. To the charism inspired initially in Saint Camillus, various ecclesial realities were gradually incorporated, which today form a unique constellation, namely, a “charismatic family” made up of men Religious, women Religious, lay consecrated and lay faithful. None of these realities is, on its own, sole custodian or holder of the charism, but each one receives it as gift and interprets and actualizes it according to his/her specific vocation in the various historical and geographical contexts. The original charism remains at the center, as a perennial source of light and inspiration, which is included and embodied dynamically in the various forms. Each one of those is offered to the others in a mutual exchange of gifts that enriches all, for common use and in view of the implementation of the mission itself. What is it? To witness in every time and place the merciful love of Christ for the sick. Saint Camillus of Lellis, whom you all acknowledge as “Father,” lived at a time when the possibility had not yet matured of an active consecrated life for women, but only that of a contemplative and monastic type. Therefore, he established an Order only for men. However, he understood well that the care of the sick should be practiced also with the typical attitudes of the feminine spirit, so much so as to ask his Religious to serve the sick “with that affection that a loving mother usually has for her only sick son” (Rules of the Company of the Servants of the Sick, 1584, XXVII). The two feminine Congregations that arose in the 19th century, and the Secular Institutes born in the last century have given completeness to the expression of the charism of mercy to the sick, enriching it with the outstanding feminine quality of love and care. You are accompanied and guided in this by the Virgin Mary, Health of the Sick and Mother of the Consecrated. From Her we learn how to be next to those that suffer with tenderness and the dedication of a mother. I pause a bit on this word “tenderness.” It’s a word that today risks being dropped from the dictionary! We must take it up again and implement it! Christianity without tenderness isn’t right. Tenderness is in fact a Christian attitude; it’s also the “marrow” of our meeting with persons that are suffering. Dear brothers and sisters, I encourage you to cultivate always communion among you, in that synodal style that I have proposed to the whole Church, in listening to one another and all women and all men in listening to the Holy Spirit, to appreciate the contribution that every individual reality offers the one Family, so as to express more thoroughly the multiple potentialities that the charism encloses. Be always increasingly aware that “it’s in communion, even if it costs effort, that a charism is revealed authentically and mysteriously fruitful” (Apostolic Exhortation Evangelii Gaudium, 130). In fidelity to the initial inspiration of the Founder and of the Women Founders, and in listening to the many ways of suffering and of poverty of today’s humanity, you will thus be able to make the gift received shine with an ever new light; and many young women and many young men worldwide will be able to feel attracted by it and join you, to continue to witness God’s tenderness. Dear brothers and sisters, I pray to the Holy Spirit to sustain this new stage of your journey as Camillian Charismatic Family. From my heart I bless you all, your communities and the persons you serve — all. And, please, do continue to pray also for me Thank you.